Located just 10 miles west of Aspen or 16 from Snowmass up Maroon Creek Road off Hwy. 82 in a glacial valley, the 14,000-foot peaks (fourteeners) truly epitomize the beauty of the Rocky Mountains. Hiking trails provide access to plenty of photo-worthy scenes in the White River National Forest, including hypnotizing wildflower fields, fly-fishermen seeking catches in tranquil Maroon Lake and brilliant fall colors on aspen trees. More than 300 million years of geologic activity, including sedimentation, uplift and erosion by wind, water and ice, are credited to the creation of Maroon Valley. According to the US Forest Service, the mountains received their distinctive maroon coloring from the weathering of hematite, an iron-bearing mineral, while Maroon Lake occupies a basin that was sculpted by Ice-Age glaciers. Because the natural landmark is so popular, there is restricted access to the area during the summer and fall. 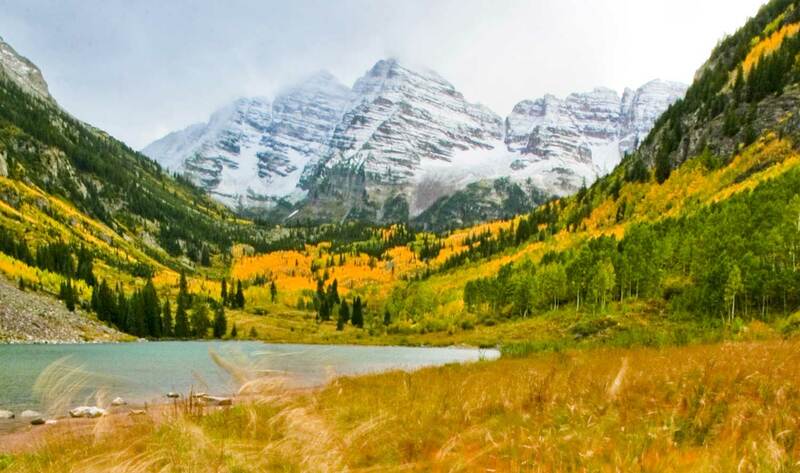 Autumn is an especially dreamy time to visit, when the Maroon Bells are cradled by cloud-speckled blue skies and golden-hued aspen groves. The best way to see the Maroon Bells is to take the public bus operated by the Roaring Fork Transportation Authority (RFTA) and visit mid-week when there are fewer crowds. The bus operates between 8am to 5pm from mid-June through early October. Bus tickets are available for purchase at the base area of Aspen Highlands Ski Area (1.5 miles up Maroon Creek Road) at Four Mountain Sports and the ticket office. Tickets are also available for purchase at the Rubey Park Transit Center in downtown Aspen. 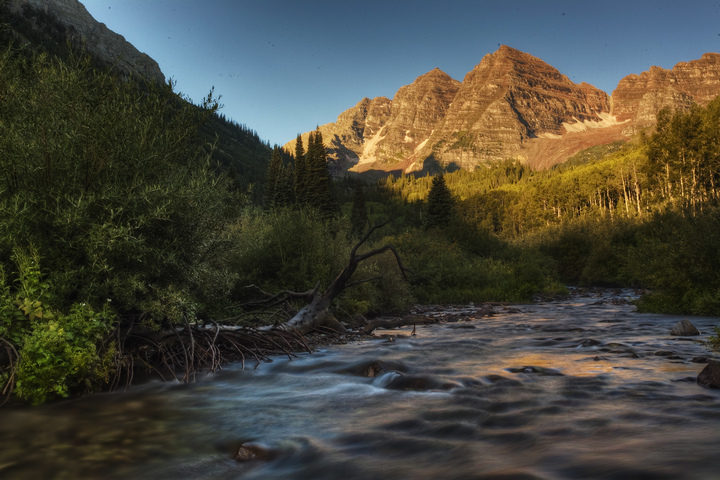 Get more information about Maroon Bells and the Aspen-Sopris Ranger District. Park your car for $5 (weekdays) and $10 (weekends) at the Aspen Highlands parking structure. You can also take RFTA’s FREE Castle/Maroon bus to Aspen Highlands from Rubey Park Transit Center in downtown Aspen. Overflow parking is available at the Brush Creek Intercept lot outside of Aspen on the RFTA bus route. Before 8am and after 5pm, you can drive all the way to Maroon Lake for a $10 vehicle free. New in 2018: The last three weekends in September, when parking is expected to be full at the scenic area and at the Highlands parking lot due to peak fall-foliage viewing, the Buttermilk lot will provide free overflow parking. RFTA buses will shuttle passengers for free from the Buttermilk Ski area to Aspen Highlands to catch the Maroon Bells buses. 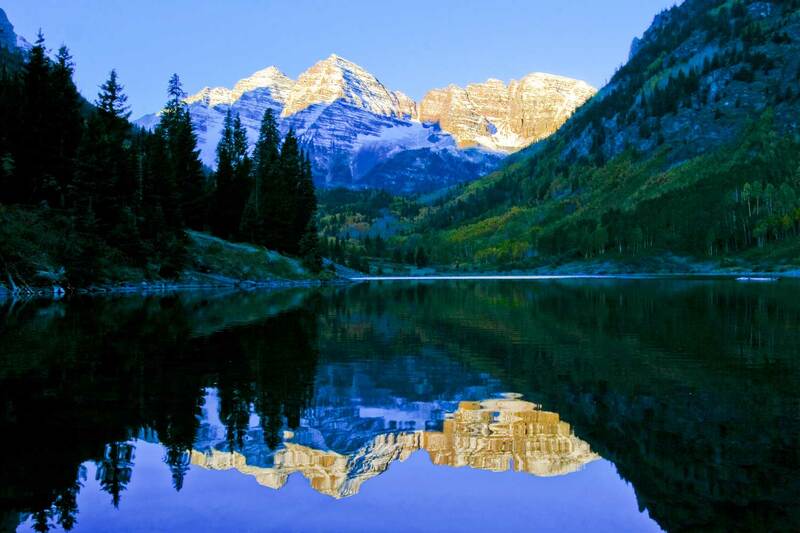 Maroon Bells Hotline 970-945-3319 is updated daily by Forest Service staff to provide information about the status of the scenic area and parking. Please call prior to arriving at Maroon Creek Road so you know the best way to proceed to visit this special place. The Aspen Chamber Resort Association and Snowmass Tourism also have great info on getting there and back. From Aspen, take Hwy. 82 to the roundabout on the west edge of town, choose the exit for Maroon Creek Road and keep going about 4.7 miles until you reach a welcome station. If you’re coming from Glenwood Springs, take Hwy. 82 south toward Aspen until you reach the roundabout (about 40 miles). If you are planning to hike in the area, be sure to bring proper shoes, sunscreen and drinking water. Dogs are welcome on the trails (and are allowed on the RFTA bus from the Aspen Highlands to the to the Marroon Bells), but they must be kept on a leash. Nestled on the banks of Maroon Creek at 8,460 feet, Silver Bell Campground has 14 tent sites and boasts gorgeous panoramas of aspen groves, wildflower meadows and towering spruce and fir forests in the White River National Forest. Access to the Maroon Creek Trail is available nearby as well as excellent trout fishing in Maroon Creek. Maroon Creek Road is closed to vehicular traffic in cold-weather months, but you can cross-country ski, snowshoe or snowmobile to the area. T-Lazy-7 Ranch offers a snowmobile tour of the snow-dusted Maroon Bells, which includes the opportunity to cruise miles of groomed trails amid wintery meadows and dense aspen groves.